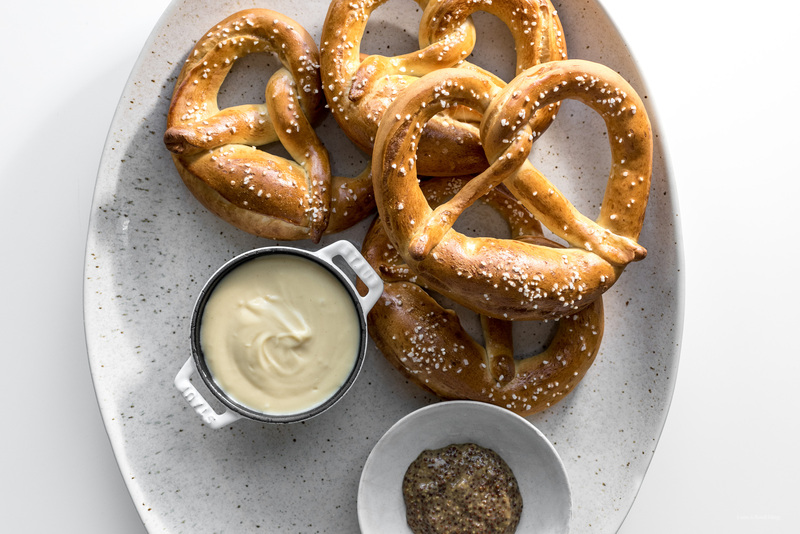 Traditional soft German pretzels, with beer cheese for all your Oktoberfest needs (kneads!). It’s Oktoberfest! Which is funny to me because it’s actually September, but I’m not one to argue with soft German pretzels, sausage, and beer. 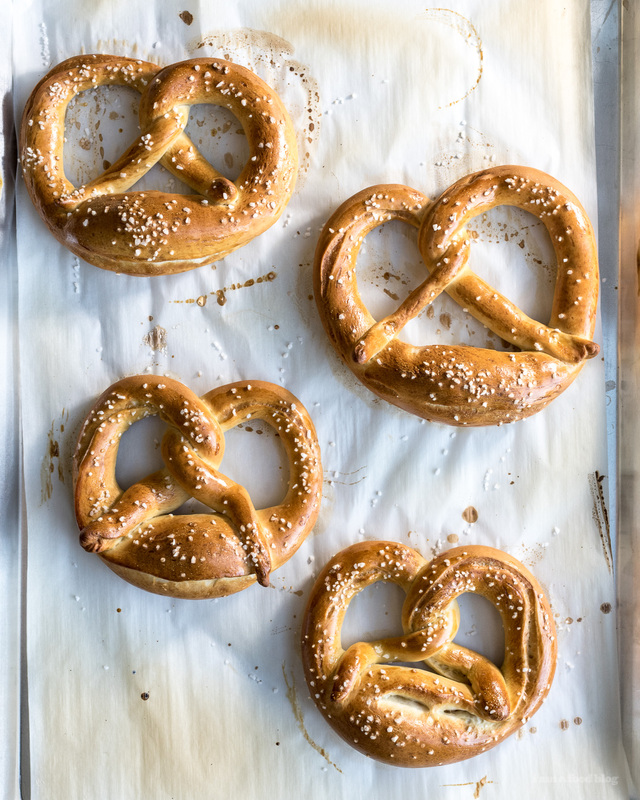 I’ve never been to Munich, where Oktoberfest – the world’s largest beer festival – is held, but one day I’d like to because I have a huge soft (pretzel) shaped spot in my heart for Bavarian food. I especially like pretzels and weisswurst, which, in Germany, go together like bacon and eggs. Since we don’t have plans to be in Germany anytime soon, I decided that Mike and I should celebrate Oktoberfest at home, with homemade pretzels, weisswurst, and beer cheese. 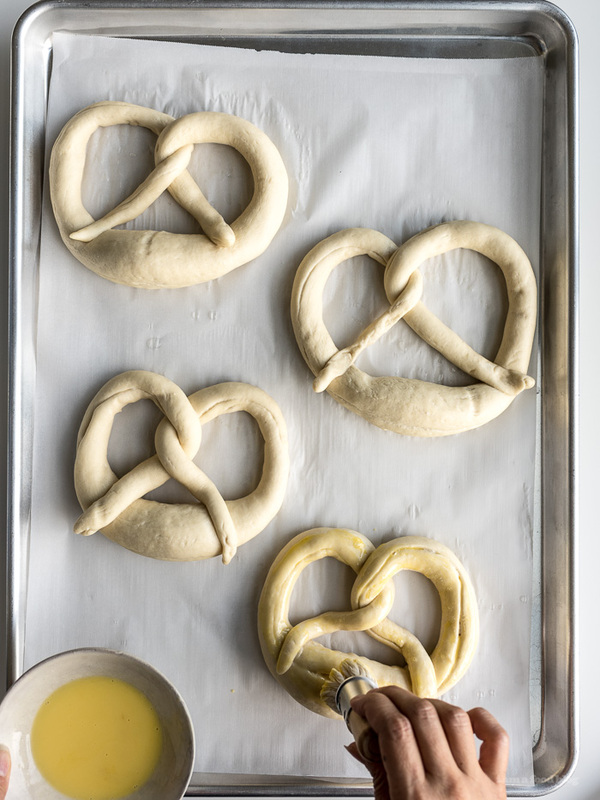 Making pretzels is no small endeavor, especially with an overnight rise, but it’s totally worth it! I first tried my hand at pretzel making last year and I have to say, I’ve greatly improved my pretzel shaping skills. It probably helps that I did a lot of pretzel eating research before trying this recipe out again. 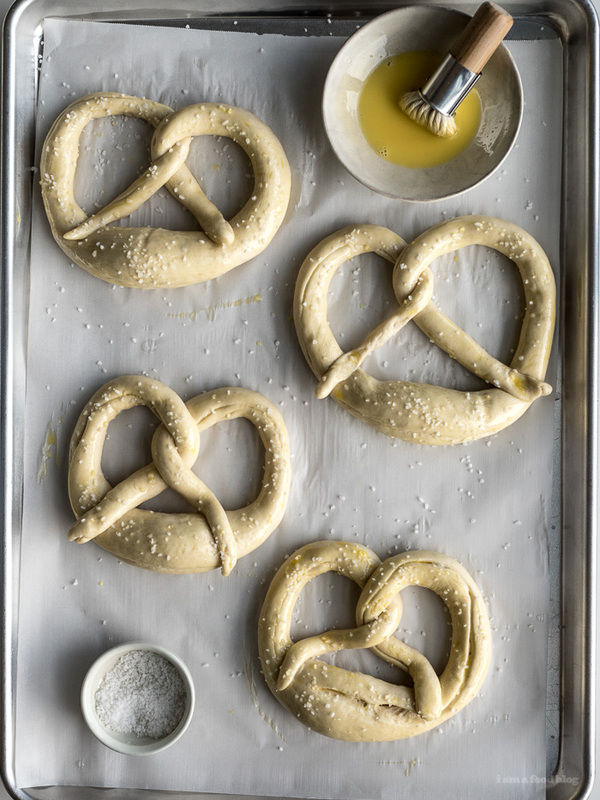 The truth is, making pretzels is dead easy. Unlike some yeast doughs, this one comes together cleanly and smoothy, and rolls out like a charm. There’s beer in the dough too, which makes it doubly perfect for all of your Oktoberfest needs. 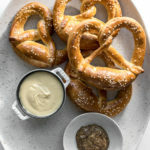 I whipped up a quick beer cheese recipe for dipping and the hardest part was not eating all of the pretzels in one go. Mike and I shared one, hot and fresh from the oven, then decided to go on a walk so we would be far away from temptation. But then I kind of sabotaged us by popping an extra one into a paper bag and putting it into my purse. Let me tell you, the smell of a fresh pretzel in your purse will drive you crazy, in a good way. Thankfully, we were able to put ourselves out of our pretzel craving torture, by eating the pretzel, of course. There was something especially celebratory and fall-ish, walking around sharing a soft pretzel in that crisp autumn air. I hope you guys make these! 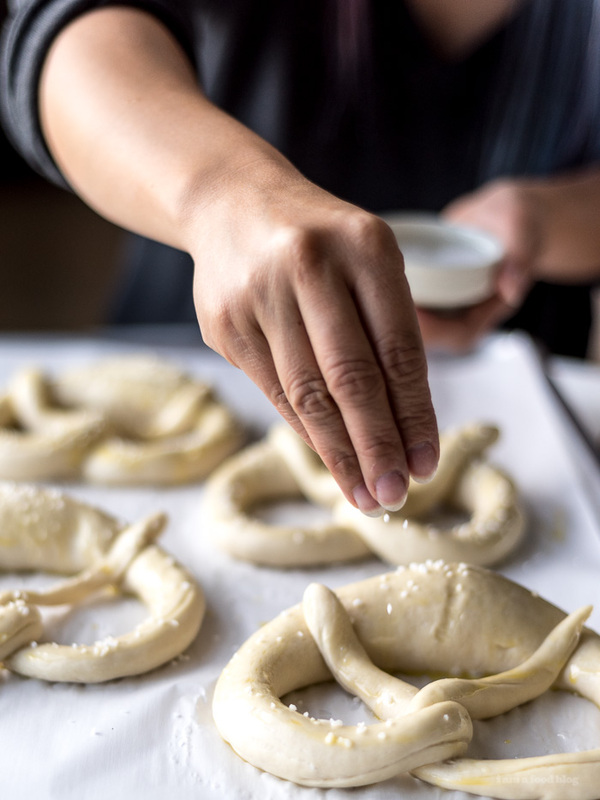 It’s my absolute favorite German pretzel recipe and reminds me of all the pretzels I ate while we were in Berlin a couple of years ago. Super traditional with just the right amount of pretzel-y flavor, soft and pillowy in some parts and denser and chewier in others. They’re the perfect combination of chewy and crisp. 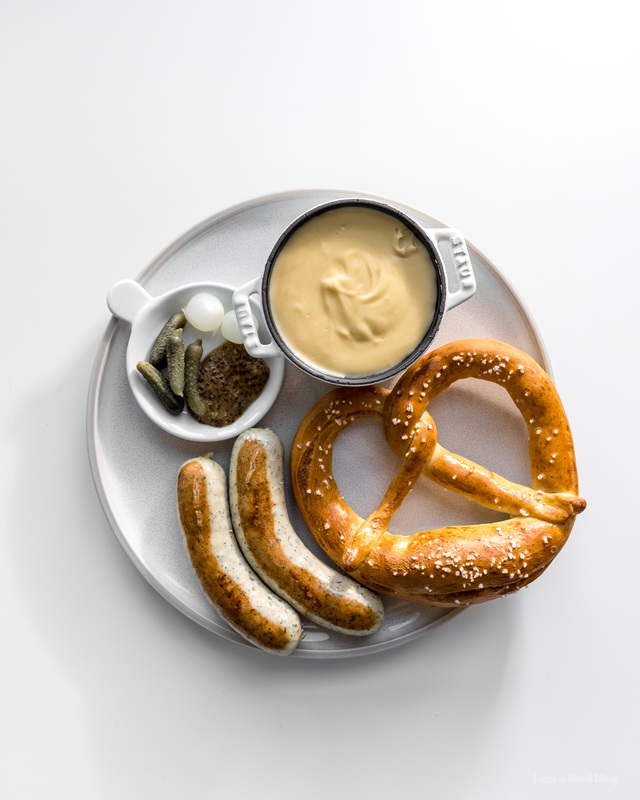 PS – I didn’t know this, but went on a deep google dive and discovered that weisswurst is only eaten for breakfast, is always boiled, and always served with a pretzel an sweet mustard. The more you know! Notes: To make baked soda, spread a thin layer of baking soda (a little over 1/4 cup) on a foil-lined cookie sheet and bake for 1 hour at 250˚F. Let cool completely and store in an airtight container and use as needed. In a stand mixer bowl, mix the water and yeast. Stir in the sugar and let activate and turn foamy, about 5-7 minutes. Mix in the flour, beer, butter, and salt to form a shaggy dough. Use the dough hook to knead, on medium low speed. The dough should form a ball after about 1 minute, firm and slightly tacky but not sticky. If excessively sticky, add flour, 1 tablespoon at a time. If too dry, add water, 1 teaspoon at a time. Continue to knead until smooth and elastic, 5-7 minutes. Place dough in a lightly greased large bowl and cover with plastic wrap. Let rise in the fridge for 8 hours minimum, up to 24 hours. Turn the dough out on an unfloured work surface. Press down to deflate and cut into 8 equal portions. Keep the dough covered with a damp cloth and work with 1 portion at a time, patting into a rough rectangle. 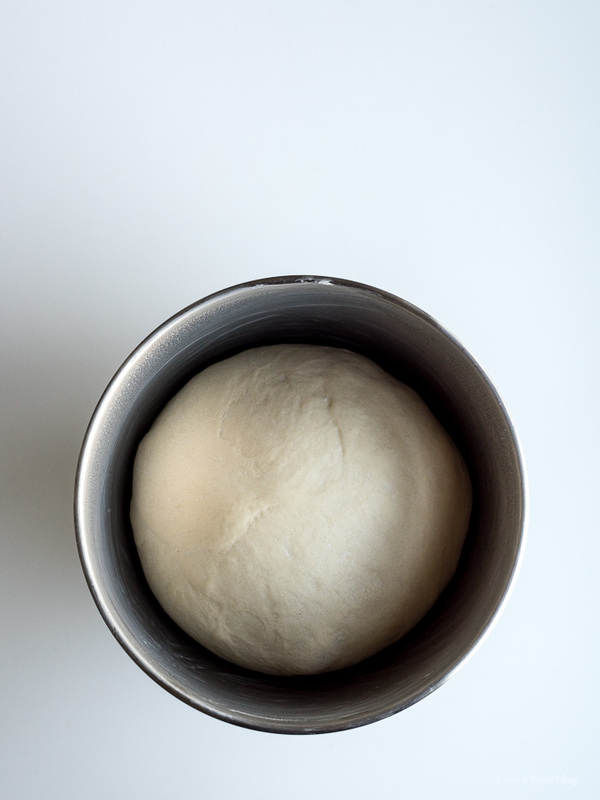 Roll the dough up tightly, forming a loaf shape. Shape into a rope by rolling against the work surface with your palms, applying a little bit of pressure, working from the centre towards the ends, keeping the center thicker than the ends. When the dough is about 12-16 inches long, set it aside, covered, to rest and work on rolling out another piece. Repeat with the remaining dough. Go back to the first rope of dough and continue to roll out until 24-28 inches, making sure the center is at least 1 inch in diameter. 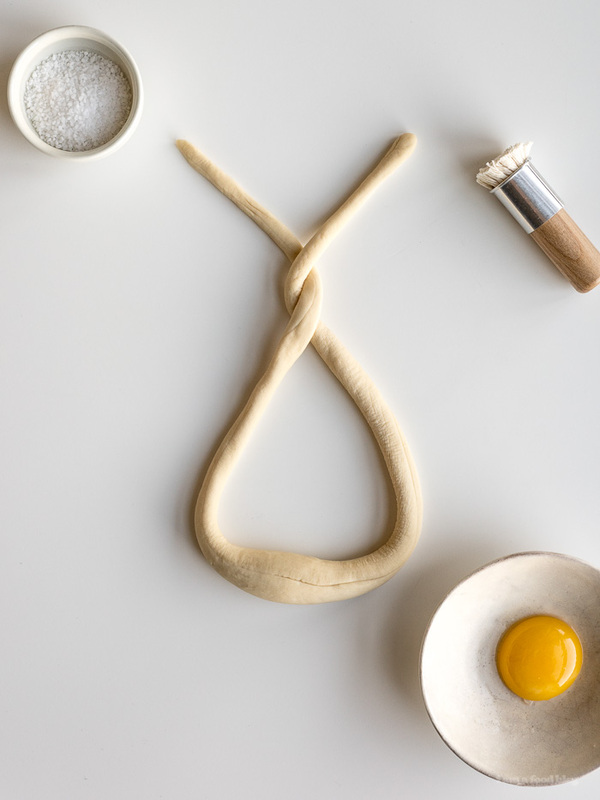 Ideally, the ends of the rope are thin so that when you bake, you get two distinct textures. When long enough, position the rope into a U-shape, with the ends pointing up. Hold an end in each hand and then cross, twice (about three inches from the tips). Bring the ends down towards yourself and press into the U at 4 and 8 o’clock. Place on the prepared sheet and cover with a damp cloth or plastic wrap. Repeat, spacing the pretzels 1 inch apart, four per sheet. Let rise in a warm spot, until 50% bigger in size, about 30 minutes. If you like, you can refrigerate the pans at this point, covered tightly in plastic wrap, for 8 hours before dipping and baking. Arrange the racks in your oven: one in the upper third and one in the lower third. Preheat to 500°F. Wearing rubber gloves, put the baked baking soda in a wide, shallow stainless steel pot. Fill with 6 cups of water. Be very careful not to splash the solution in your eyes or on your skin. Turn the hood vent on high and warm the solution over high heat until you see wisps of steam. Carefully remove from the heat and wait until the steam subsides. 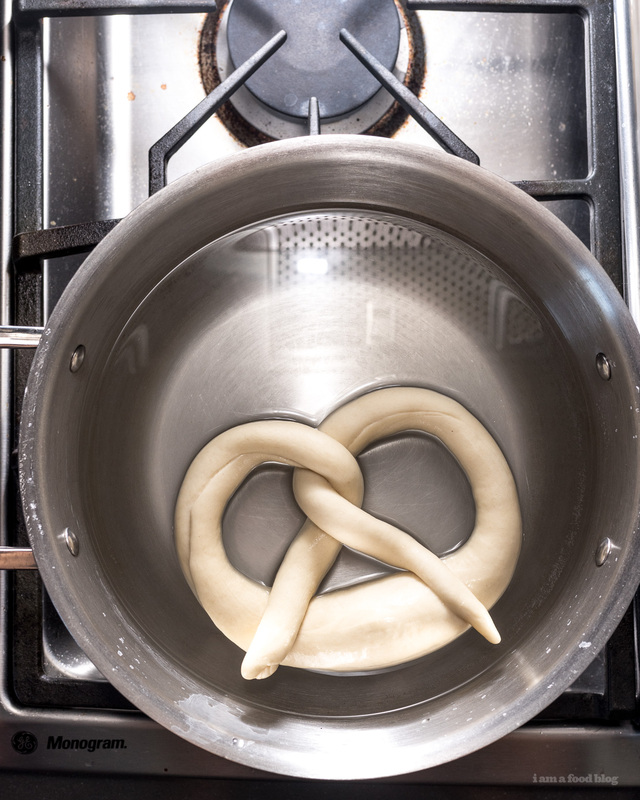 While the alkaline water is still hot, use a large skimmer to dip the pretzels, one at a time. Soak each pretzel for 10 seconds, flip, then soak for another 10 seconds. Brush with an egg wash, then top with coarse salt. Immediately bake until the pretzels are deep mahogany, 8-12 minutes, rotating the pans, front to back, top to bottom, half way through. Cool on a cooling rack for 10 minutes before enjoying! ooh yay! 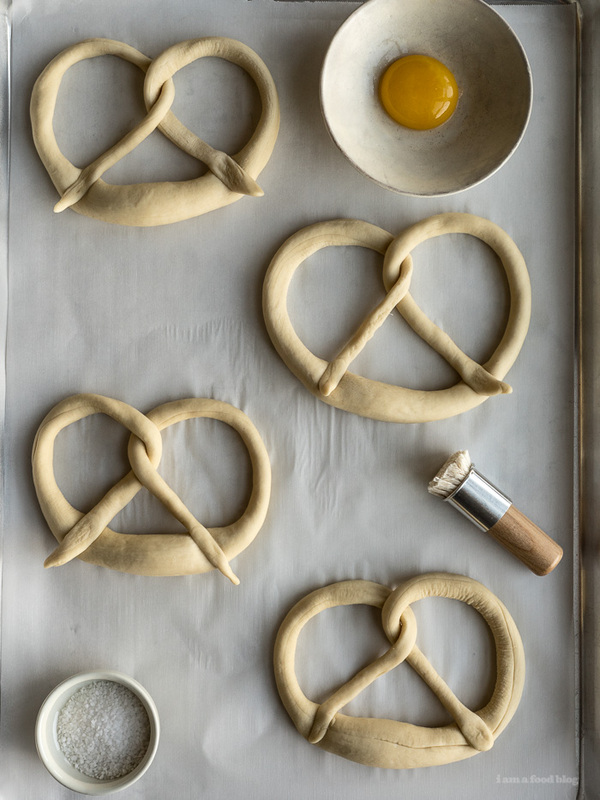 pretzel making on the weekend sounds perfect! heehee i really need to do more german recipes! i have spaetzle and schnitzel on my list! If you make spaetzle, make käsespätzle with lots of fried onions! They’re one of the best things I ate in Munich. Did you know weisswurst is supposed to be removed from the casing before you eat it? Because I did not until the last day of my trip. and yes to the spaetzle with fried onions…SO GOOD!!! To hell with pumpkin spice. This is my favorite flavor of the season – pretzel and beer! And absolutely YES to the beer cheese! Can’t wait to try this recipe out! right?! warm pretzels and beer cheese for all the fall feels! the shapes of these look awesome! also, walking around in crisp air with a hot pretzel sounds magical. i also need to move around more to offset everything i’ve been eating, so walking around while eating works, right?! This makes me miss Germany so much. Thanks for sharing the recipe. I will have to try these! It’s before 9 a.m. and I want this. pretzels for breakfast is perfectly reasonable! mmm…imagine them with eggs?!?! I made the dough on December 23rd, baked on the 24th, my first batch of Soft Pretzels and I’m very pleased . I used barley malt instead of brown sugar but otherwise stuck to the recipe. I had to use a little flower for rolling out the ropes because they were sticking but just a light dusting. These were fun to make and delicious. I’ve made bagels and always wanted to try pretzels and I’d recommend this recipe, i’ve Already shared with two of my sisters. thanks for taking the time to leave a comment! i love these pretzels and am so please that they were part of your winter celebrations :) pretzel party! !